If you’ve never made a dump cake before, it is super simple. Basically, you dump all the ingredients in a specific order into a baking dish, mix lightly (if at all) and place in the oven. This recipe only calls for 5 ingredients and makes a yummy dessert. It doesn’t get any easier than that! Preheat oven to 350º F. Grease a 13″x 9″ pan. Dump pineapple with juice into pan. Spread evenly. Dump in pie filling and strawberries. Sprinkle cake mix evenly over filling (do not mix). Slice butter and top cake mixture. Bake 50 minutes until top is lightly browned. Serve warm or at room temperature. 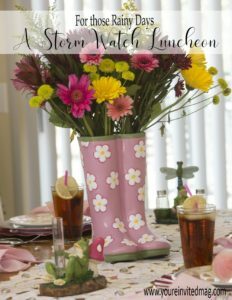 Click below for more on our Storm Watch Lunch.